Normally we don’t like to talk about our projects and sites until they launch, but I had to direct you to our upcoming launch of Themes.com to call attention to the great work done by our lead designer on the “Coming Soon/Splash Page”. Check it out here before it is gone and is replaced by the “real” site. 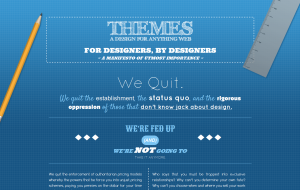 Themes.com will be a new marketplace, according to our branding documents “For Designers, By Designers”… so maybe he was just super-excited to play in his playground. This splash page highlights our manifesto that we created, describing the vision we have for the domain. When we start on any new Domain Name, we spend the first while truly understanding the space. After all, we are not building mini-sites or mass developed parked pages. Every name we tackle can become a category-defining brand and business unto itself.